I've been sitting on this song for quite some time. I'm still not even sure if this song will appeal to anyone else; it's too traditional folky to be indie. Perhaps I've been absorbing too much adult contemporary radio at work lately, but this song, this album are the only things that keep me going through the day. The song's cheesily ironic lyrics ("Bump and grind/Have a good time"), and completely retro sound only aid my enjoyment of the song, bringing a smile to my face. 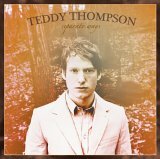 Supposedly Teddy is the son of famed British folk legend Richard Thompson, though I've never heard of him, so I won't expand on how Teddy carries on his father's brilliant folk legacy. No, I'll leave it just at that. Rather, I'll let you absorb Teddy on his own without all that baggage. I'm pretty sure you'll like him all on your own.